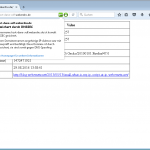 In my last posts I covered a secure installation of BIND as an authoritative DNS server, as well as the implementation of DNSSEC. This is really mandatory because without a signed DNS zone DANE would be useless. Though I am using BIND for the examples below, DANE can be used with any other DNS server, too. 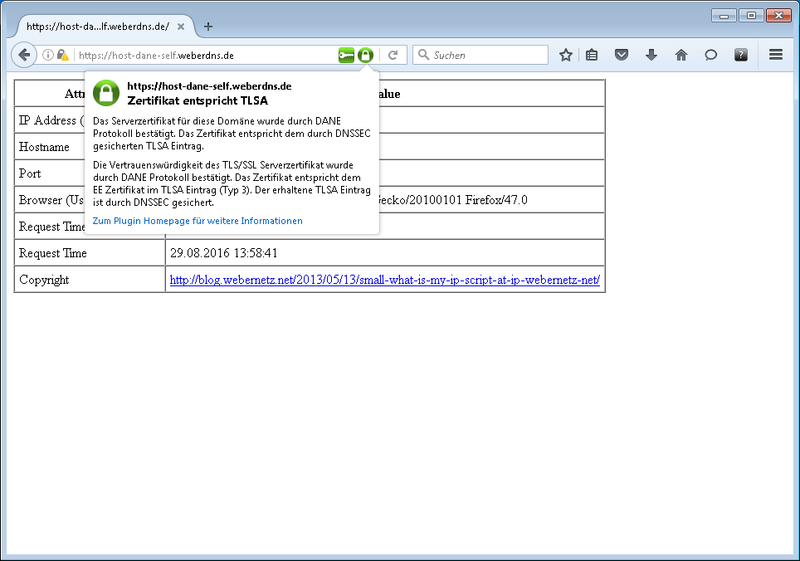 Today, a browser establishes a secure TLS connection to a known server (DNS name) with an “unkown” certificate (not proved by the end user). We are relying to certificate authorities (CAs), which once verified the certificate to be owned by the server operator. Unluckily, any (!) CA is able to sign every (!) certificate in the world, even if a certificate is NOT owned by the server itself, but by a malicious third party that wants to intercept the secure communication via a man-in-the-middle (MITM) attack. 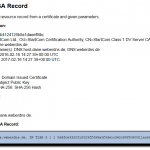 With the new DNS resource record “TLSA”, the hashed public key is publicized within the DNS server of the same authority/entity that owns the TLS server, e.g., an HTTPS server or an SMTPS mail gateway. Now, an end user client can really validate that the server TLS certificate is owned by the same organization which owns the DNSSEC server. 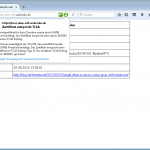 Hence, MITM attacks with spoofed certificates are not possible anymore. For more information about DANE, refer to the RFCs: 6698, 7218, 7671, and 7672. Note that in all three cases a TLSA check is valid though only the first TLS certificate is correctly signed by a trusted CA with its correct common name! 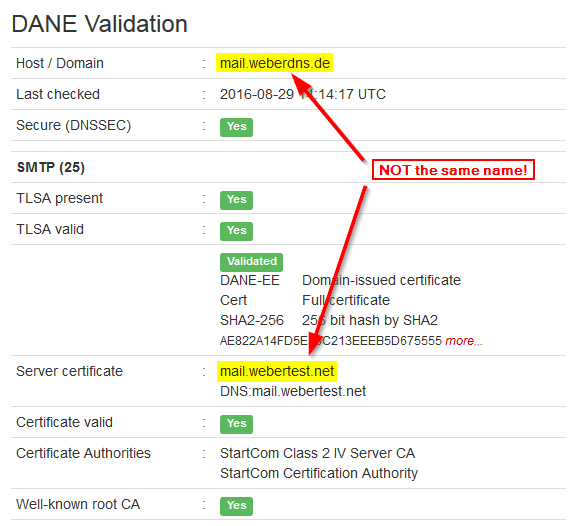 This is the main advantage of DANE, that self-signed certificates can be used, even with incorrect names, as long as the certificate itself is the correct one published in the DNS. And by the way, for more information about DANE, have a look at the resources from “sys4”. They offer a DANE mailing list as well as a common mistakes help page. 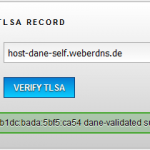 The only good browser plugin for checking DNSSEC and DANE records is the “DNSSEC/TLSA Validator“. Unluckily it is not updated since almost two years (as of October 2016) and I ran into some Firefox errors while this plugin was enabled. That was easy! With only some little DNS resource records, much more security, i.e., authentication, can be achieved. Browsers can access self-signed websites without relying on (malicious) CAs, and MTAs (mail transfer agents) can send mails with the usage of TLS directly to the correct (authentic) destinations. Featured image “KW5-Nummer-Martin” by Martin Ilich is licensed under CC BY-SA 2.0. Thanks for this. FYI, beginning with BIND 9.11.0, BIND will return TLSA records (if present) in the additional section when responding to a request for MX or SRV records. Hii ..According to the example which you explained you have a live domain registered with domain registery. I have a doubt, For example if we are running a completely private domain including root node and Top level domain without registering to the Domain registery , Is it possible to develop DNSSEC Hierarchy by our own and then implement DANE and TLSA over it?. Because normally in live domains according to DNSSEC hierarchy the hashed DS segment of the child node is stored in parent in domain registery.But how to implement for a completely private network? 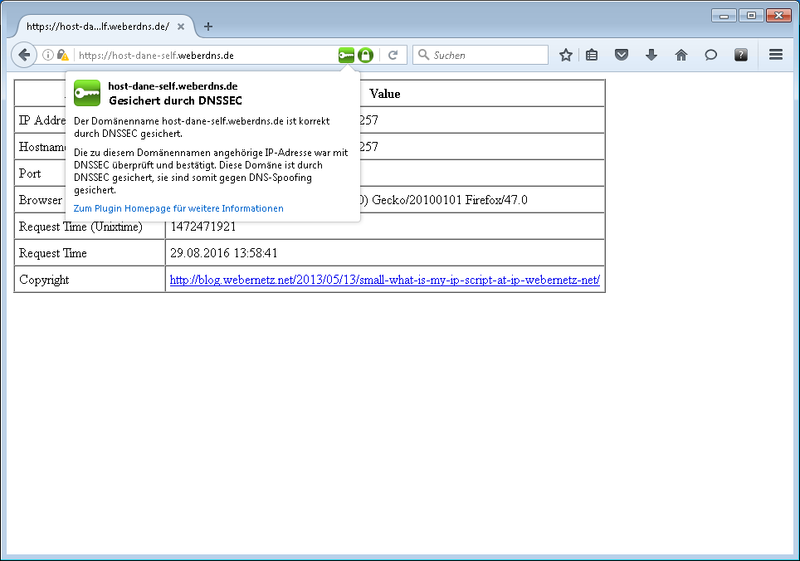 And yes, you can use DNSSEC for private/hidden domains. The DNSSEC validating resolvers simply need your “trust anchors”, which is the KSK, type 257. For example, BIND uses the “bind.keys” file which currently has the two KSKs for the “.” root domain. You can add your “private.domain.tld” KSK there. Or you can completely override the root domain with your own root KSK. But be sure about what you’re doing! When you’re overriding the root KSK you might get other problems when your using DNSSEC with “real” Internet domains. 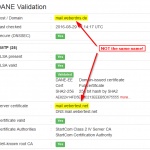 A crucial part of implementing DANE is planning for key/cert rollover. This means that at least some of the time, a single TLSA record is not enough. At least one of the TLSA records needs to match the “previous” certificate chain, and at least another needs to match the “future” certificate chain. 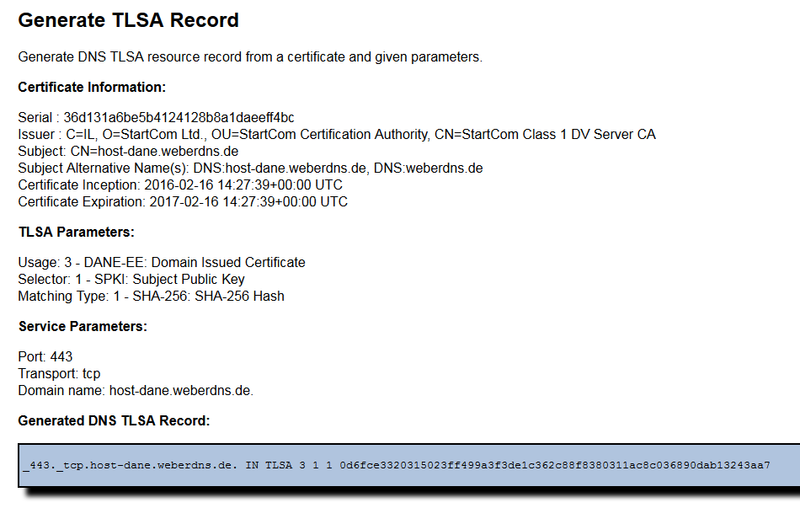 Introducing a second TLSA record a few DNS TTLs before rollover and then removing the original after can be a complicated process to execute correctly. Therefore, for the majority of DANE users, I *strongly* recommend that they *always* have at least two TLSA records, only *one* of which changes at the next key/cert replacement. With the first approach the key for the next rotation cycle is generated as soon as the current key is deployed. 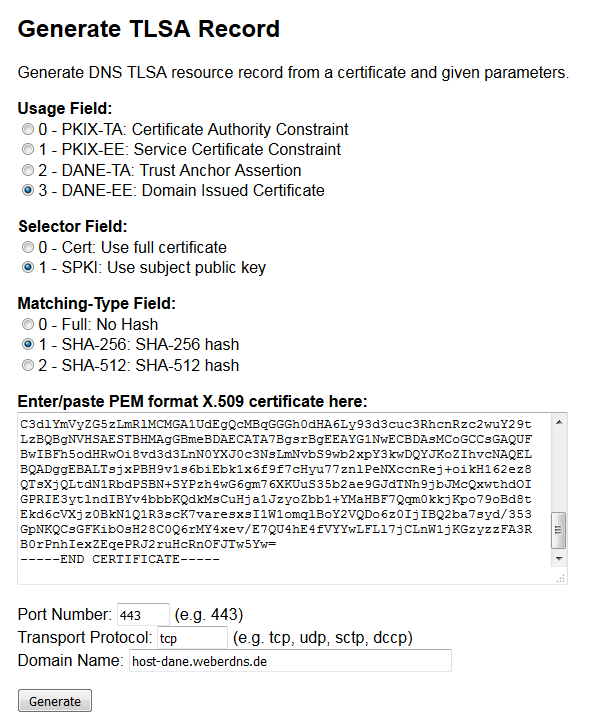 The TLSA record is then computed, and pre-published in the DNS (along with the 3 1 1 record for the new live key) as soon as the new key goes live. Later, when it is time to generate a new certificate, the pre-generated key is used, and the process repeats. With the second approach (potentially less secure when using a third-party CA) the stable “2 1 1” key that matches the key of an intermediate issuer CA (or root CA, but then the root CA MUST appear in the server’s full chain file, which users tend to neglect to do) ensures that DANE continues to work even as the server’s key is changed and the “3 1 1” record becomes stale. After the rollover, a new “3 1 1” is generated and published, making both records valid again. When the issuer key is about to change, the server must then make sure to use the same key as before to obtain a new certificate from the same issuer, and in that case replace the “2 1 1” record after the rollover. Regardless of the approach, MONORING and good scripting of the process (perhaps fully automated) is critical, so that key steps are not forgotten if done by hand. I wonder about port 25? You put it into the TLSA record. Will this mean that this port is opened for plain text messages too? This would be nothing anyone wants. yes, you’re right that connecting to port 25 should use STARTTLS to encrypt the channel. You can configure this on your mail appliance. 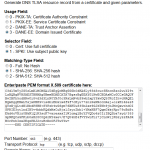 For example, on a Cisco ESA you can use “TLS required” for that. This still (!) uses port 25, but ONLY accepts messages with STARTTLS. However, you can also use implicit TLS on port 465 to use encryption by default.